Welcome back to our summer edition of the Road Diet Quarterly Update! We have made great strides on integrating Road Diets nationwide and I am excited to share some of our latest efforts to advance this proven safety countermeasure. In our ongoing effort to educate state and local leaders, the general public, and other transportation stakeholders on the benefits of Road Diets, we are launching our "Did you know a road can go on a diet?" campaign. This campaign is bringing together individuals from around the United States to share best practices and strategies on improving roadway safety. Through engagements such as the New Mexico Peer Exchange and the Washington, DC ThinkBike Workshop, we are collaborating with experts on how to implement Road Diets. This Quarterly Update contains more information on these events, project updates from across the country, and the latest insights from Road Diet practitioners – including an interview with Mr. Doby Class who has implemented multiple award-winning Road Diets in the City of Arcata, California. Finally, for more information on Road Diets, please visit: https://www.fhwa.dot.gov/innovation/everydaycounts/edc-3/roaddiets.cfm Join our mailing list to make sure you receive future Road Diet Quarterly Updates. 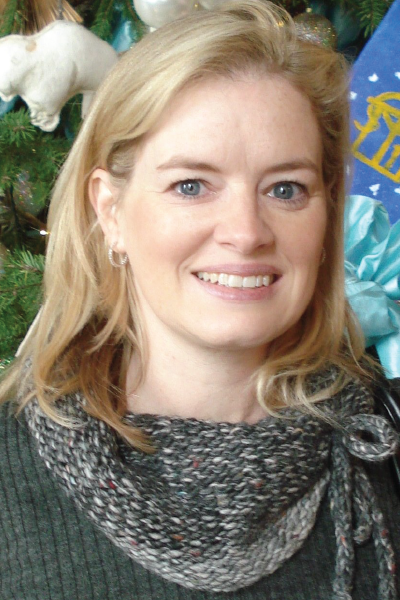 R. Charles "Doby" Class, PE, is a City Engineer for the City of Arcata, California. During the recent Western Road Diet Peer-to-Peer Exchange in New Mexico, Doby spoke about a few successful examples of Road Diets implemented in Arcata. After the event in New Mexico, we followed up with Doby for a Q&A to learn more about these award-winning Road Diets, which include the H Street project—The World's Shortest Road Diet— and the Samoa Gateway Project, the 2014 Caltrans Excellence in Transportation award recipient. Goals for the Arcata Road Diet projects include improved accessibility/multi-modal arrangements, increased quality of life, increased revenues, civic pride, improved circulation, traffic calming, and beautification. In the 2000 budget cycle, we applied for CalTrans funds for the Samoa gateway project– a beautification effort. This project was to upgrade a four-lane highway, State Route 255, which had very narrow sidewalks that were rather ugly and uninviting. Following a traffic study with CalTrans, our goal was to upgrade this area for pedestrians and visitors, so they could connect this location with the idea of "I'm in a town that I would like to visit." We installed new 6-foot sidewalks with vegetation areas, stonework, and bike lanes. The difficult part of this project was deciding how to build-in these beautification aspects while maintaining safety and working with the CalTrans design guide. This roadway includes a critical emergency access/egress route for tsunamis and is a primary southern input for large trucks. Therefore, CalTrans required maintaining a 20-foot passable area with mountable curbs and wider-than-average bike lanes. These various considerations made it very important to involve all stakeholders in all decisions. This project went on to be used as a CalTrans model project and was the recipient of the 2014 Caltrans Excellence in Transportation award. On Samoa Boulevard, we were grinding out two travel lanes. The road required that the new design slow down traffic speeds. Samoa Boulevard was a fairly frequent site for crashes and a child had been injured while attempting to cross the four-lane road. 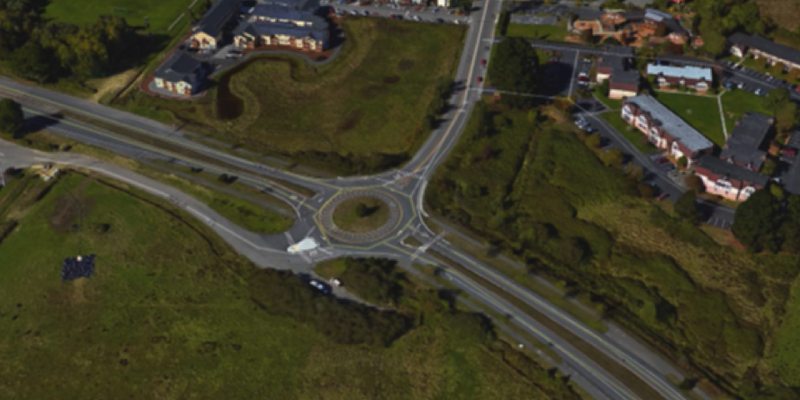 The location lends itself to adopting a roundabout. We had never constructed a roundabout before, so we researched some examples used in England. This allowed us to understand how to determine the level of service and how a single-lane entry worked. We learned that roundabouts have a large impact on left-turn collisions. Typically high-speed "T-bone" collisions are avoided completely in a roundabout. Furthermore, drivers do not like to stop. In a roundabout, you can put more cars on the road and guarantee they will travel slower without requiring them to stop. What were some of the improvements you saw in the areas with Road Diets? This project initially brought on a huge amount of controversy from the public. [Road users asked] why are you slowing us down? What is the goal? For us, it was both a safety and a beautification project. This project went toward our increasingly popular policy of a more livable environment for walking and using your bicycle. Arcata is like a mini Berkeley [California] or Portland [Oregon]. We are in a transformative process making a real emphasis on the quality of life. My mantra is, "every trip begins and ends on your feet." We want to encourage the idea that individuals are no longer solely reliant on single-driver vehicles. Let's de-emphasize the car. Let's get back to multi-modal use near roads. We are looking to make sidewalks that aren't just the sides, they are a walk. What advice would you give to engineers or transportation professionals when they are considering a Road Diet or roundabout? You cannot be afraid of change. The book says it should be this way, but there is always room for improvement and Road Diets are one of the ways that can help. Be brave. You need to be able to stand there and have the confidence that this is going in the right direction. Do not be afraid to try something different using a baby step at a time. We tried once, then again, and then several times since then. If you feel a project is right and you have the support, there is no reason not to do it. Get right out there honestly with what you want. Knock on peoples' doors with an open invitation, "here is the concept – what do you think about it?" Make sure everyone, including the movers and shakers, knows what is going. Allow people the opportunity to provide comments. Everybody gets a door-hanger. Show how the ancillary benefits could be great as opposed to long-term maintenance cost. The aesthetic improvements we supplied really intrigued people. Remember: slow down and arrive alive. To learn more about these and other roadway safety improvement projects introduced and implemented in the City of Arcata, visit: www.cityofarcata.org. 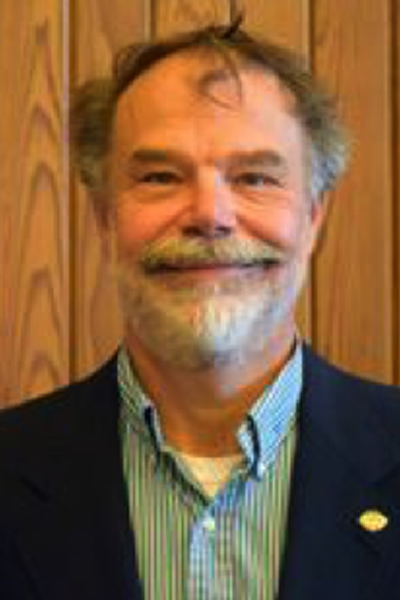 Mr. John Donahue, Design Analysis and Policy Manager for Washington State Department of Transportation, explains how WSDOT design policy has been updated to include Road Diets. 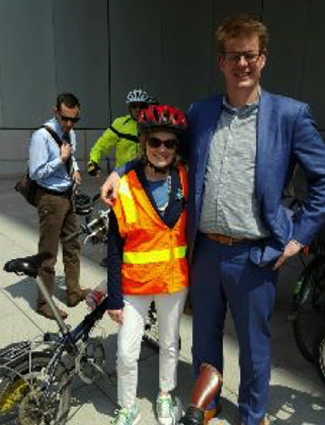 Becky Crowe, FHWA and Sjors Van Duren, Royal Netherlands Embassy, take a ride through Washington D.C. to determine how to best improve the city's infrastructure for bicyclists. 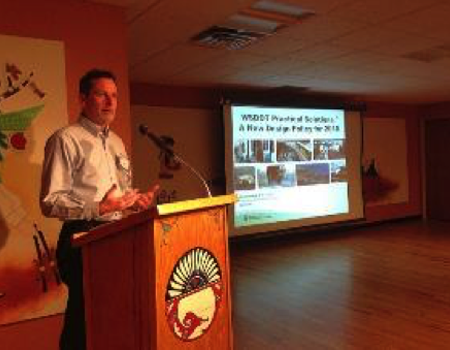 As part of our initiative to share industry best practices on Road Diet implementation, the Western Region Road Diet Peer-to-Peer Exchange was held in Albuquerque, New Mexico, on April 12 and 13, 2016. The participants explored how Road Diet projects can further enhance safety, accommodate the use of other transportation modes, encourage economic development, and improve overall livability along a road corridor. Examples of non-traditional Road Diet projects discussed at the peer exchange included one-way streets, divided roadways with raised medians, and five-lane to three-lane conversions. States were invited based on their Every Day Counts (EDC) Road Diet implementation status and goals, as well as regional proximity. The attending states included New Mexico (host), California, Nebraska, Oregon, Washington, Oklahoma, and South Dakota. More than 40 multidisciplinary representatives from the Federal Highway Administration (FHWA), State DOTs, and local agencies had the opportunity to ask questions, exchange information, and share learning experiences with their peers on various Road Diet topics. There was a wide range of experience among the attendees. This included state DOTs who were just beginning to implement their first Road Diet to the Cities of Portland, Oregon, and Seattle, Washington, that have more than 100 combined Road Diet projects. One unique feature of the peer exchange was an evening technical field visit to completed and potential Road Diet projects. As the meeting concluded, each participating state made a specific commitment to work towards implementing Road Diets. Given the success of the April event, planning for additional peer exchanges is already underway for other states wishing to implement Road Diets in their areas. The District Department of Transportation and the FHWA collaborated with the Royal Netherlands Embassy on a ThinkBike Workshop on April 21 and 22, 2016, in Washington, DC. The workshop brought together Washington, DC-area transportation planners, Dutch bicycle transportation experts, and cyclists to design a bike network plan for a neighborhood in the nation's capital. The goal of the workshop was to provide specific recommendations on bicycling infrastructure in Washington, DC, that recognize and address the need for a connected network, tradeoffs, and challenges. As part of the workshop, transportation specialists traversed through the city on bicycles to directly understand the best way to improve the city's infrastructure. By doing so, participants were able to acquaint themselves with the city, identifying key opportunities and challenges to implementing high-quality bicycle infrastructure. Based on their analysis, and using the bicycling recommendations from MoveDC, the District's multimodal long-range transportation plan, as a guide, groups began to design their recommended bicycle network for the study area. On their second day, groups began putting their plans into action, by making decisions on streets and designs, and identifying key opportunities and obstacles to implementing their bicycle network. The group focused on intersection conflicts, bicycle parking, and Road Diet options. Need Help With Road Diets? Providing guidance about Road Diet implementation, including selecting candidate locations, capacity constraints, public outreach response, evaluation metrics, EMS, slow moving vehicles, cost, or funding. Lastly, FHWA is also offering FREE Road Diet workshops. For more information on the workshops, please visit: http://safety.fhwa.dot.gov/road_diets/resources. Each quarter we take a look at different locations across the country where Road Diet projects are being discussed and implemented. Kansas: The City of Lawrence, Kansas, is considering reconstructing Kasold Drive with a Road Diet and a single-lane roundabout to better serve the bicyclists and pedestrians. Following the public information meeting held by the Lawrence Pedestrian Coalition, construction on the street is slated to begin this year. Louisiana: In January, Louisiana hosted a Complete Streets Peer Exchange in Baton Rouge to discuss practical implementation of complete streets. This exchange focused on retrofitting Complete Streets into existing roadways and used examples of implementations from across the nation. North Dakota: In March, the Northland Chapter of the American Traffic Safety Services Association held a How to Training and Education Workshop in Fargo, North Dakota. During an EDC-3 (Every Day Counts) breakout session, participants discussed innovations and strategies to improve safety, including smarter work zones and Road Diets. Shore News Today – On March 29 and 30, 2016, residents gathered at two information sessions to share options and solicit input for improving pedestrian and bicycle safety in Ventnor and Margate, New Jersey. The Advocate – This week in Lafayette, Louisiana, road crews restriped a small stretch of Bertrand Drive between Johnston Street and North College Road, bringing four lanes down to two, while adding a center left-turn lane and bike lanes on the side. It's the first step in a more extensive makeover being eyed for that area of Bertrand, and there has been talk of new sidewalks, landscaping, and street parking. DNA Info – The study by engineers from the Chicago Department of Transportation found that conditions did not warrant the installation of a stop sign or traffic signal in the 3400 block of Austin Avenue near Newport Avenue where a 7-year-old girl and her 14-year-old sister were hurt during a hit-and-run crash last February. [The]…engineers recommended allowing rush-hour parking on Austin Avenue from Belmont Avenue to Addison Street to "improve safety along this corridor by reducing sideswipe and rear-end crashes and also calm traffic by physically narrowing the travel lanes," also known as a "road diet," according to the study. Voice of San Diego – Last month, the City of San Diego repainted a half-mile section of the 101 known as "the dip," removing two of the four travel lanes and adding buffered bike lanes – essentially implementing what's known as a Road Diet, where lanes are reduced or reconfigured to make travel more efficient and safe. is a publication of the U.S. Department of Transportation, Federal Highway Administration. We welcome your comments and Road Diet safety-related articles. The purpose of this newsletter is to increase awareness and provide information and resources of Road Diets to local and state transportation authorities as well as the general public.